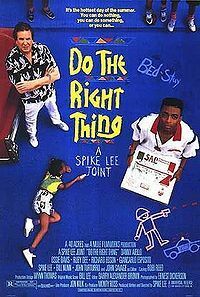 Do the Right Thing is a 1989 American ensemble film produced, written, and directed by Spike Lee. The film deals with issues of racial conflict in the multi-ethnic community of Bedford-Stuyvesant, a neighborhood in Brooklyn, New York, during the hottest day of the summer. Director Lee stars in the film, alongside Danny Aiello, Ossie Davis, Ruby Dee, Richard Edson, Giancarlo Esposito, Bill Nunn, and John Turturro. The film is also notable in that it marks the feature film debuts of both Martin Lawrence and Rosie Perez. The film was a success at the box office, and received numerous accolades and awards. The film has grown in stature over time; in 1999, it was deemed "culturally significant" by the United States Library of Congress and selected for preservation in the National Film Registry, one of five films to do so in its first year of eligibility. In 2007, the American Film Institute listed the film as the ninety-sixth greatest American Movie in Film History. The song "Fight the Power" by Public Enemy is a recurring aural motif in the film, as blasted from a huge boombox toted by Radio Raheem (Nunn). It appears 15 times in the film.